An amusing diversion that left me having to pause the video because I was laughing so hard.. Some of the running gags run a bit long but this is more than made up for by the jokes you don't see coming from a mile away. Well worth the watching, if only for the many, many, MANY cameos. You will want to wait and see this until after The Day of The Doctor, if only so the final gag after the credits makes a bit more sense. But once you have, you can see it here. The 50th Anniversary of Doctor Who is fast approaching and everyone is excited about the announcement of a special film being made for the event. Particularly the surviving classic Doctors, who are eager to have a part in the proceedings. Not that they're hurting for work, mind you. Well, except for Colin. Sylvester's doing The Hobbit. Paul's doing a lot of television work So is Peter. And did Sylvester mention he's doing The Hobbit now? When Steven Moffat refuses to return their calls, Peter suggests a bold plan - a protest that The Powers That Be at the BBC won't be able to ignore. With his fellows behind him (at least when Paul's shooting schedule allows it) the Doctors begin a vigil before the BBC HQ in London... only to be reminded they shoot Doctor Who in Cardiff now. 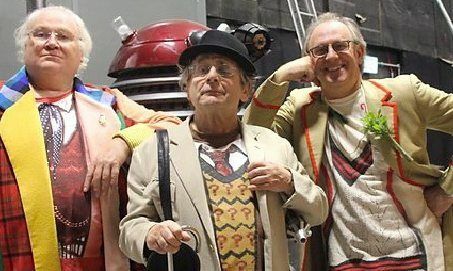 So begins another quest... to get into the 50th Anniversary Special by hook or by crook.... no matter how many favors Peter has to call in to his son-in-law, David. * Granting that the actors are largely playing themselves (or at least, the public perception of them), the performances are all quite good. * The cameos are all amusing and the ones not immediately obvious to some fans (i.e. David Tenannt's wife being Peter Davison's daughter) are explained away easily enough in the text. * My favorite gag? The Tom Baker in Shada footage used to explain why Tom Baker isn't present. * The running gags about the classic Doctors not being recognized and disrespected by their own families do run on a bit long. * The last gag leaves me wondering... was that really The Classic Doctors under the sheets in that one scene?